The word “unique” is not a word I bandy around lightly. In fact I am hesitant to use it at all, and never do so without great consideration. I surely owe this reticence to my father, whom I would describe an avid, old-school grammar enthusiast. Lessons on proper grammar were dispensed freely in my youth, and at an early age I learned to spot and correct split infinitives, subject-verb disagreements, terminal prepositions and many other common errors. In my rebellious teen years I became a sort of grammar vigilante, always on the lookout for corruption and quick to rectify it upon detection. Much like Batman I was the hero people deserved, but not the hero they needed (or wanted to be friends with). My father also periodically pontificated on the word “unique” which – he claimed – could be used only in an absolute sense and must certainly never be subject to a modifier. The word literally meant “one of a kind” and therefore something could not be more unique, less unique, partially unique or anything else of the sort. A thing was either unique or it wasn’t, and this programming lodged itself firmly in my brain. If prodded, my father would have to concede that he has little tolerance for the evolution of language. The fact that terminal prepositions, for example, have become largely accepted in all but the most formal writing would be of little interest to him. I imagine he cringes when I begin a sentence with a conjunction like “and” or “but.” But I accept that grammatical conventions change over time, and I enjoy the liberties that allows me. My father would probably blame the phrase “more unique” on this supposed evolution too, and would denounce it as a dumbing-down of the English language. It would irk him then, to learn that “unique” has been used with modifiers since its inception into popular usage in the mid-nineteenth century1. Hopefully he doesn’t read this. If you’re confused about why you clicked on a picture of a bird and have now read not one but five paragraphs about grammar (that is if you’re still reading at all) it’s mostly because this is my blog and I can write what I want, so there. But it is also because you need to understand that when I describe the Hoatzin as unique, I really mean it. I mean it in an old-school, no compromise, grammar-police sort of way. This bird is one of a kind, no modifiers needed. 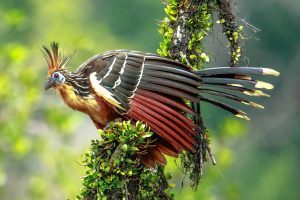 To understand the uniqueness of the Hoatzin (generally anglicised as “h-what-zin” but derived from the Nahuatl or Aztec languages) you need to know a little about taxonomy. Taxonomy is the system we use to classify living things, and that system has seven levels. The levels are kingdom, phylum, class, order, family, genus and species. Stay with me here. To classify an organism, we start by assigning it to a kingdom, which is relatively easy as there are only six of them. They are animals, plants, fungi, tiny things, bacteria, and more bacteria2. Birds are animals and the Hoatzin is a bird, so we’re off to the races. Within the animal kingdom there are about 34 phylums. That would be more complicated, but 33 of them are filled with squishy things that mostly live underwater, and only one – the Chordata – contains animals with bones. Birds have bones. Check mark. Things get a little weird at this point because birds belong to a class called Sauropsida, which also contains snakes, lizards and all the other creatures we traditionally call reptiles. Birds are essentially flying crocodiles, but that’s a topic for another post. On we go to order, and this is where we start to divide the birds (and other reptiles) into some big chunks. Bird orders include groups like songbirds, waterfowl, owls, and so on. At the family level we divide birds into smaller, closely-related groups. Families are groups like sparrows, woodpeckers, flycatchers, penguins, etcetera. Genus and species go together, and they make up the scientific (or Latin) name of a given creature. A Lion, for example, is in the genus Panthera and the species leo so its scientific name is Panthera leo. There are other cats in the genus Panthera, but there is only one Panthera leo, and that’s the Lion. At long last we come full circle, and we can now begin to grasp the uniqueness of the Hoatzin. Take a few deep breaths here, as the heaviest lifting is yet to come. The Hoatzin’s scientific name is Opisthocomus hoazin, and it is the only bird in the genus Opisthocomus. That genus belongs to the family Opisthocomidae, and the Hoatzin is the only bird there too. That family, in turn, belongs to the order Opisthocomiformes and – you guessed it – that order contains a single bird: the Hoatzin. Allow that to sink in for a moment. The order Passeriformes – the songbirds – contains over 5000 species. The order Falconiformes contains only the falcons, but there are still 60 of those on the planet. But in the order Opisthocomiformes, the poor Hoatzin sits all alone. It wasn’t always so. It turns out that the Hoatzin’s ancestors parted ways with the other birds about 64 million years ago, shortly after most dinosaurs went extinct. At one time there were at least eight species in the Hoatzin’s family, but the other seven remain only as fossils. The Hoatzin, then, is a relic. It is a living fossil, delivered from another time and with essentially no relatives among living birds. This unique family history makes for one hell of a unique bird. The South American, rainforest-dwelling Hoatzin is roughly the size and shape of a chicken, and it looks like the mascot for your sixteen-year-old’s death metal garage band. Its long, dark wing and tail feathers give it a cloaked appearance, and make its body look massive in contrast to its relatively tiny head. Its face is featherless and the skin is brilliant blue, punctuated by dark red eyes. Sitting atop its cranium is an orange, spiky crest that would be the envy of any ‘90s goth or punk rocker. Hey man, which way to the Blink 182 show? The Hoatzin’s weirdness doesn’t stop with its looks though, and there’s plenty more unique hiding under the surface. 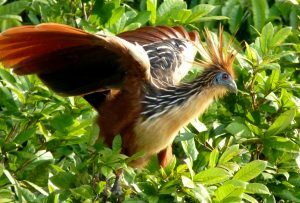 The Hoatzin doesn’t eat seeds, or fruit, or insects, or meat like a normal bird. Instead it is intent on eating leaves, a diet that very few birds in the world can subsist on. Leaves are difficult to digest, especially when you can’t chew them, so the Hoatzin employs a solution straight from the barnyard: it incubates the leaves in its enlarged crop3 and ferments them with the help of the microorganisms that live there. The Hoatzin is basically a cow, and it is reputed to smell like one too4. The folivorous Hoatzin has one more bizarre trick up its sleeve. Its chicks (which are unsightly) have two gnarly claws on each wing. The adult Hoatzin builds its nest over water, and if a predator happens by, the baby Hoatzin simply lets go of whatever it’s hanging on to and tumbles into the drink. It then uses its demonic little claws to clamber its way back towards the nest for a reassuring meal of regurgitated, fermented leaf mash. Many one-word-birds could lay claim to the word “unique.” It is their uniqueness, after all, that often earns them their rare and unusual names. But it seems to me (if my father will forgive me) that some are more unique than others. And which of these special birds could claim to be the most unique of all? It has to be the Hoatzin, and there’ll be no debate on that. 1Merriam-Webster, unquestionably my favourite dictionary, addresses this very debate: https://www.merriam-webster.com/dictionary/unique. 2I may be using a little poetic license here, but things that are too small to see have never been my forte. 3The crop is a pouch-like storage organ in the throat of most birds. 4I’m not joking. The barnyard-odour of this animal has earned it the colloquial name Stinkbird.